How many times have you skipped a meal because you were running late for an appointment? In most cases, there’s not enough time to whip something up when you’re in a rush to leave the house. This is one of the reasons why people who are tight on schedule opt to order takeout instead. Restaurants that offer takeaway meals always make sure to accommodate their customers by using a special menu to showcase their offers. With only a few minutes to spare before an important appointment with a client, you decide to grab a bite at a nearby restaurant to fuel your energy as you prepare yourself for a two-hour meeting. Given that it’s rush hour and restaurants are packed with locals and tourists who are there for the same purpose, ordering takeout would be a more efficient alternative to ensure you don’t leave the restaurant empty-handed. 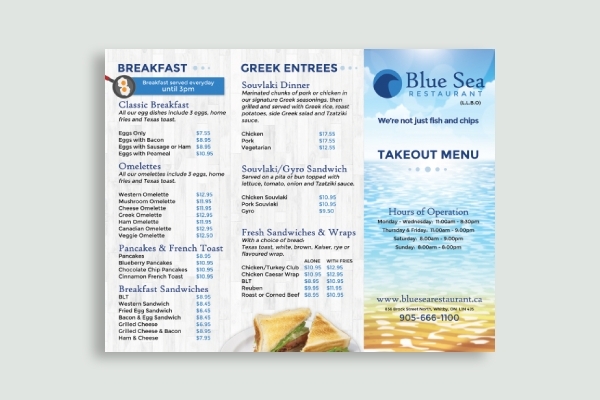 To cater to the needs of each customer, this template will help you generate a takeout menu that’s worth the time and attention of your audience. 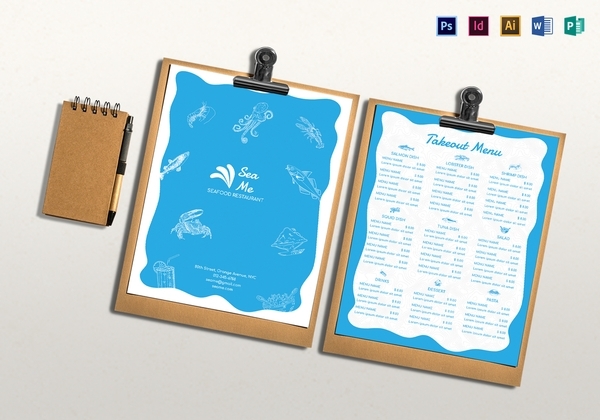 This also offers you a head start to the design process to ensure that your menu meets the desired standards of the market. Burgers are one of the easiest to-go meals to consume when you’re in a hurry. 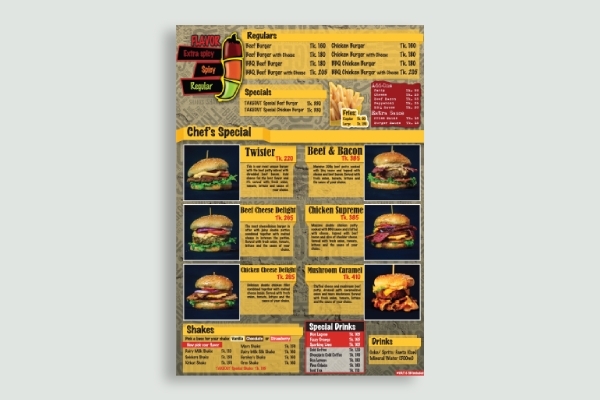 Carrying a burger around as you walk toward your next meeting for the day is great for those who have a hectic schedule to follow, which is why you might want to make it easy for customers to order what they want by designing a burger menu that is readable and well-organized. 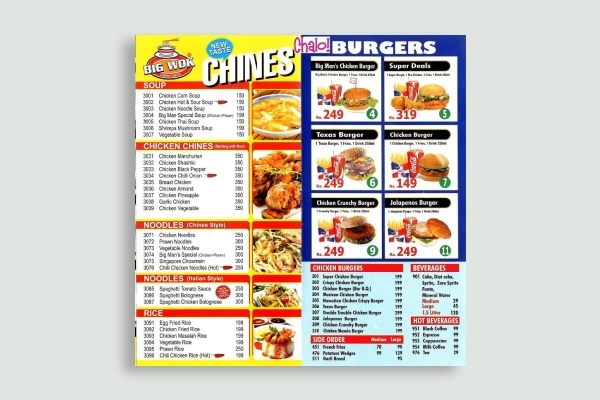 It’s also a good idea to categorize the items on the menu based on their specific types so customers won’t have a hard time deciding which add-ons would go best with their burger. Most of the food options you find in a diner are based on anything that’s grilled. This includes breakfast food such as eggs, bacon, waffles, pancakes, and French toast. A lot of these small restaurants are located along the outskirts of town, which is often convenient for travelers who have a long journey ahead of them. A few pits tops at these diners will be enough to fill their empty stomachs for the road. But for those who hope to reach their destination before dark, you might want to have a takeaway menu ready to address their needs. The menu can contain specially prepared items that are easy to munch on as they cruise along a busy freeway. A lot of fast-food chains have a takeout lane for customers who choose not to dine in the establishment. The items listed in the menu are arranged in such a way that is convenient for customers to find what they want, place their order, and go. This gives you enough time to attend to the next person in line before they decide to purchase a meal from a restaurant beside yours that has fewer people. Since most fast-food chains carry a ton of options in their menu, it’s always best to highlight the most profitable items in your list for better business. The food menu should follow a pattern that will encourage diners to order more than they intended to before they leave the establishment. Ordering takeout from a fancy restaurant can be a challenge for some due to the type of dishes being served. An Italian menu is often filled with a variety of pizza and pasta platters that are sometimes difficult to consume while in a rush. 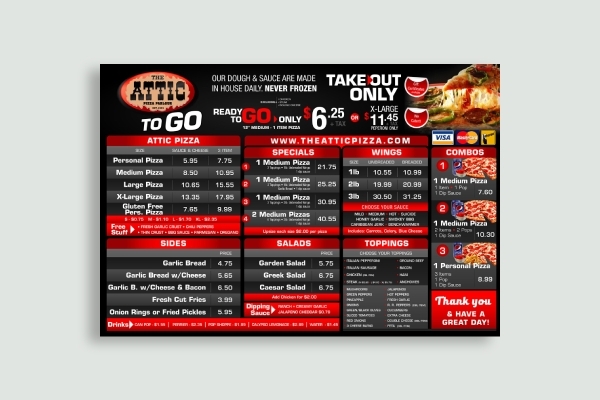 So to make sure your customers are catered to accordingly, make sure to design a separate menu for takeout orders. This should contain food arrangements that can be packed and sealed to prevent a messy disaster from spilling on your car seat or ruining your favorite suit. Cafeteria food can sometimes sound less appealing after having the same type of meals every day for the last four weeks. This is one of the reasons why office workers and students would rather splurge on takeout food for lunch when they have the means to. 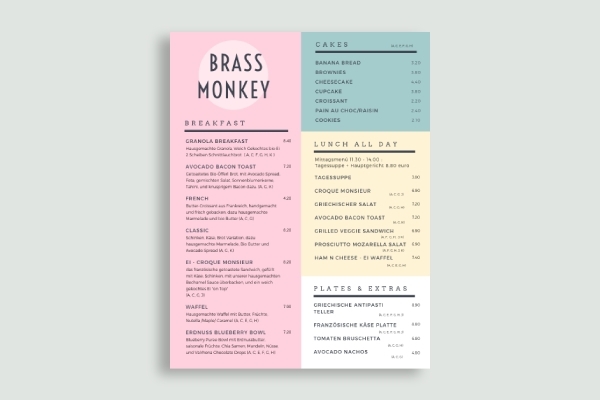 But because most customers are probably stuck in a time crunch, it’s important to design a lunch menu specially designed for takeaway orders. 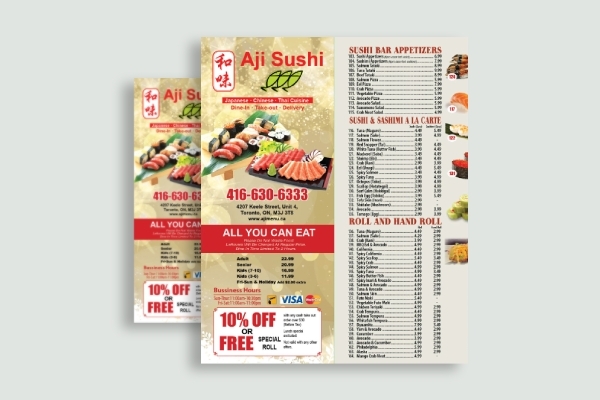 You can even give away a few menu brochures that customers can take with them to share with friends and colleagues. Some food stalls are specifically designed for takeout orders only. Not only is it a cheaper business investment, but it also encourages people to purchase something from the menu by eliminating the instance of longer orders and a crowded atmosphere. So if you happen to own a pizza parlor in the middle of the city, it’s best to design a pizza menu that’s worth a second look. This should be enough to grab a person’s attention and build a sense of urgency that’s hard to shake off. After devouring a scrumptious meal at your restaurant, some diners might be interested to bring home a few treats for their friends or family members to try. 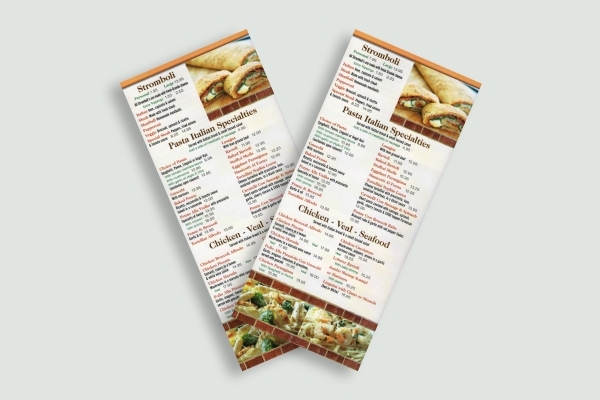 In such cases, make sure to have a restaurant menu ready for these takeaways. 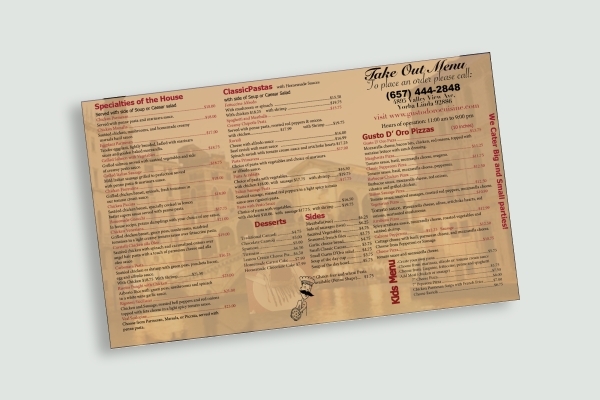 The takeout menu should contain the right details for each order, including extra charges for packaging. Be sure to update the menu regularly to avoid any confusion or misunderstanding with guests. Sports bars and billiard halls are known to serve food to guests in an attempt to increase their daily sales and keep the business afloat. Apart from the beverages available at the establishment, finger foods are also sold to stimulate one’s thirst and persuade customers to order more drinks for their table. Anyone who wishes to take home a few dishes with them after having a couple of drinks at the bar can order something from the restaurant’s takeout menu. 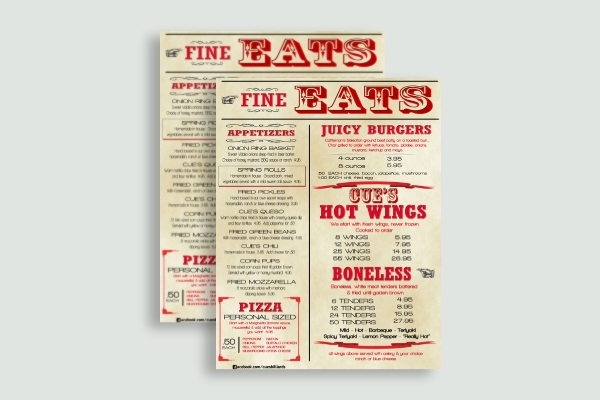 Shown above is a common example of a rustic menu that is specifically designed for the said purpose. Who doesn’t love sushi? After a long day at work, an appetizing set of sushi rolls is sure to satisfy your cravings and turn your mood around in a snap. So for customers who’d rather devour a plate of sushi at the comfort of their own homes, it’s best to design a menu that provides them this option. Items in the menu should offer customers the opportunity to enjoy some of your specialties without being forced to order every single item available.